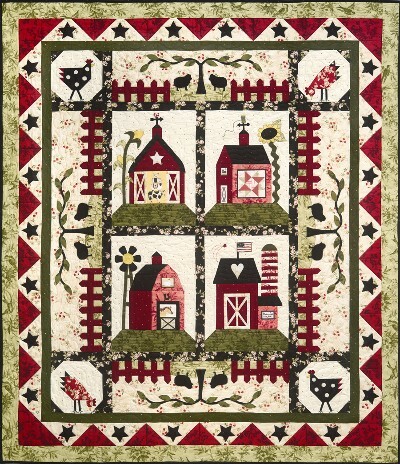 quiltmercantileblog News from our wonderful world of quilting! We had a wonderful time at Quilt Market. We restocked our needle nannies which were a BIG hit from Spring Market(shown in that market post). We purchased new dies for the accuquilt Go! systems. We bought the digital cutter system—Slice which is to arrive soon. We look forward to playing with it. We restocked our product from Block Party Studios. They have some fun printed panels and labels. We signed up and ordered some of the laser cut kits which you have probably seen in the Keepsake Quilting catalog. This company laser cuts the time intensive applique projects by McKenna Ryan (and many more designers). Her new botanical pattern is very beautiful. We are taking pre-orders for that one. Quilting Treasures has several new fabric lines that we loved and look forward to receiving in the months ahead. You might check out their website to get a sneak peek. Today we received a new fabric line by Riley Blake called Mod Tod. Laura already has the project well on it’s way. We have two new Block of the Month projects that you will be able to purchase complete or monthly. Pictured below. The very adorable applique project, “Raining Cats and Dogs” is designed by Anne Sutton of Bunny Hill Designs using Moda fabrics. You can start that one now or the first of the year. We are very excited to finally have made the plunge into Stone Henge fabric by Northcott. This neutral block of the month uses the VERY popular Ramblin’ Rose pattern set by Marti Michell. Fabrics should arrive in Feb. 2012. Sign up and reserve your spot! Make sure to keep an eye on our retreats and classes. Don’t miss your chance to join Just Jennifer in her retreat the first weekend in December to make her very popular jacket, new vest pattern, or quilted purse. You will finish during retreat! Don’t miss the opportunity to join Alice Wilhoit once a month to improve your applique skills. Her main focus will be the Freezer Paper Starch Method but she will help you with any of your applique needs every first Saturday. Bettie Hammock has a great new technique class. The stunning samples are in our store. We have a lot going on in the store. Stop by for a visit. What a beautiful spring day! I am excited to post this picture of the new block of the month BOM) by The Quilt Company. I love it! Arlene and Melissa have outdone themselves again. Take a look on our web store for pricing, etc. Let me know if you would like to be included in this BOM through our store. For those online, we always package a complete set to help save on postage. Vickey and I are headed to Spring Quilt Market next Thursday May 12th late afternoon. Please be advised our store is CLOSED May 13th-16th so we will process any online orders upon our return. We are excited to see all of the new products at market. I am going to market to find some awesome national teachers to come run retreats in 2012. I plan to see the designer of the “skillbuilders” panel right off the bat. The machine quilting retreat is May 20th-22nd and Jackie plans to use these great products to help participants gain confidence in their custom quilting abilities! If you have some type of sit-down quilting unit that is portable (like the Handi-Quilter sit-down) or you want to learn how to use your home sewing machine to finish your ever growing stack of quilt tops—this is a great opportunity. Click on the schoolhouse on our home page and you will see a listing of all our upcoming retreats. We will soon have some pictures posted of Quiltagious Quarters. Let me know if you have any questions. We are working very hard to update our online store since making Quilt Sampler Spring 2011…We have so much more than you see currently on our web store. So much to do…so little time! Enjoy your day. Quilt Across Texas has begun! New fabric lines coming ! Time to Inspire and Energize!